Below I am going to walk you through three of the most popular treestand styles and some of the advantages and disadvantages of each. Ladder Stands Ladder stands are my favorite type of tree stand to hunt from and the kind that I primarily use on my own hunting property. When purchasing a ladder stand, you get the platform, seat, and ladder all bundled in one convenient package. Also, they are easier to climb in and out of than the lock on stand or climbing stand, thanks to the ladder. These stands are not very portable, but they’re a great choice for hunters that are planning to hunt in the same spot for an extended period of time. The ladder stand offers a variety of features which you can choose from. Some include a safety railing which can double as a shooting rail. A skirt can be added to help aid in concealment. The ladders also range in height – some ladder stands will only come with a single ladder while other may include multiple ladder sections giving you the ability to make them the height you prefer. As an added-bonus, there are models that can seat one or two hunters! This is a great option if you are teaching young hunters as it allows you to share a stand with them. One downfall to a ladder stand is that they are heavy, bulky and it takes a couple of people to install it. Which isn’t a big deal, it just means that you will have to find someone to help you. My dad and I usually plan a weekend to put up new tree stands together. Once they are installed, they often provide a spacious, comfortable and stable platform to hunt from. Self Climbing Treestands Self Climbing Treestands or ‘climbers’ are among the most portable treestands on the market. They give hunters the ability to easily carry the stand in and out of the woods, much like a backpack. They also allow hunters to adapt to hunting conditions by moving to a new location; adjusting height and changing the direction your stand is facing quickly and quietly. Climbing stands are a two-piece treestand that allows the hunter to “walk” up a tree. The stand is made up of a top piece which is the seat and the bottom piece which is the platform. Using this type of treestand requires practice, so practicing at ground- level before the season is recommended. When using a climber stand, tree selection is very important, more on that later. To install the stand you will secure both portions of the stand around the tree using some sort of adjustable cable which is included with the purchase of the stand. To climb you will use a push-down, pull-up method. Move the top portion of the stand up the tree and then push down while transferring all your weight to the top half. Using your feet bring the bottom portion up the tree, then transfer your weight from the top portion to the bottom. Repeating the action until you reach the desired height. The downside of using a climber is it takes practice to be able to use proficiently and you need to choose your tree wisely. The tree should be reasonably straight, large enough to support the stand, and not have any branches between the ground and the desired location. Hang-On or Fixed Stands Fixed stands fall in-between the ladder stand and the climber. They are an affordable option and consist of a simple platform and seat. These stands must be secured into place using chains or straps and require separate climbing aids such as climbing sticks or screw-in steps to access the stand. These are a great option for a semi-permanent stand. What I like most about hang-on stands is they enable hunters to set up in odd shaped trees or in trees that have a lot of branches, breaking up your silhouette from deer. Another positive to hang-on stands is they are easy to set up next to another stand or above a stand if you are planning to hunt with another person or cameraman. Hang-on stands are generally lighter than a climber stand, but they require more effort and noise to install. Also, these stands typically have a smaller platform and don’t have any type of rail around them, so if you are not comfortable with heights this may not be the stand for you. 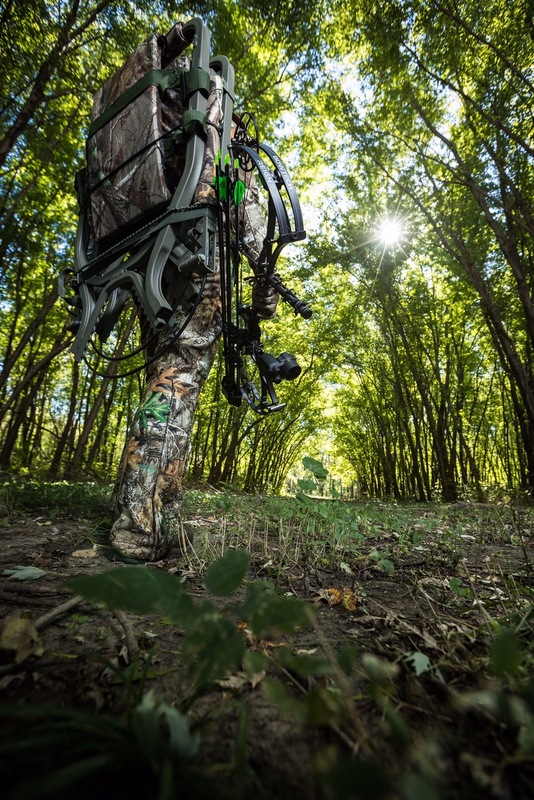 When it comes down to it, selecting the right treestand will depend on your personal preferences and the area you hunt. Just remember that no matter which treestand you decide to use to always wear your safety harness before leaving the ground!